Patrick is the Founding Partner and CEO of Merrimack Potomac + Charles (MP+C), one of New England's leading integrated public affairs and strategic communications firms, with offices in Boston, MA and Concord, NH. During his over 35 years working in strategic communications Mr. Griffin's clients have been some of the largest consumer brands in the world, including Coca-Cola, Anheuser Busch, The Tri-State Lottery, NASCAR, Dunkin Donuts, and McDonald's. Prior to launching MP+C, Mr. Griffin was the Founding Partner and CEO of Griffin York & Krause, now GYK/Antler, a full-service advertising, brand building, and digital marketing firm where he holds the title of Chairman Emeritus. Mr. Griffin has also served as the Managing Partner of Purple Strategies' New England office. 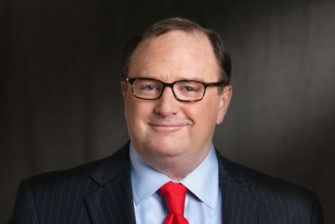 Beyond his national consumer brand work, Patrick has worked as a Republican media consultant to four U.S. presidential campaigns including President George H.W. Bush, President George W. Bush, U.S. Senator Lamar Alexander and Governor Mitt Romney. During the 2016 election cycle he served as a Senior Advisor to New Hampshire Governor Chris Sununu's successful gubernatorial campaign and as a consultant to Governor Jeb Bush's Right to Rise USA PAC. Additionally, Mr. Griffin has been involved with numerous U.S. Senate and Congressional campaigns and retained as a media consultant by both the National Republican Senatorial and Congressional Campaign Committees. Patrick is the author of two books: "Pay No Attention to that Man Behind the Curtain" and "Primary Columns." He appears regularly as a political commentator on MSNBC, CNN, Fox News, NPR, and WCVB TV (ABC News/Boston), where he frequently provides on-air analysis and insight into the current state of American politics with a focus on what's happening in Washington, DC and the New England region. Additionally, he lectures across the country on politics, brands, and the media and has served as a senior fellow at the New Hampshire Institute of Politics at St. Anselm College as well as a regular lecturer at Harvard University's Kennedy School of Government. Patrick appears regularly on regional and national television as a political analyst for MSNBC, CNN, Fox News, CBS News and NPR. He also serves as a political analyst and contributor for WCVB-TV (ABC/Boston); Fox 25 News, NECN and WGBH TV (PBS) also in Boston. Patrick is a 1981 Stonehill graduate and was elected to the Board of Trustees in the spring of 2001 and currently serves as Vice-Chair. He serves on The New England Council's Board of Directors, the Board of Advisors for the New Hampshire Institute of Politics at Saint Anselm College, and is a former trustee of The Derryfield School in Manchester, NH. A lifelong New Hampshire resident, he splits his time between Boston and the Granite State.